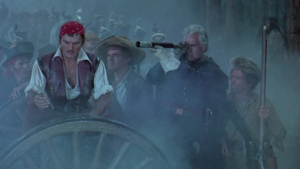 This is Cecil B. DeMille’s 1958 widescreen Technicolor remake of his 1938 film about pirate Jean Lafitte and the Battle of New Orleans. It stars Yul Brynner (as Lafitte) and Charlton Heston (as Andrew Jackson), both of whom had been breakout stars for DeMille in The Ten Commandments two years before, and for that reason I expected to like it even more than the earlier version. And for a fact, Brynner and Heston do not disappoint. Brynner’s brooding screen presence is even more imposing than that of predecessor Fredric March, though he lacks the glimpses of touching vulnerability that March gave the character: Brynner is bulletproof. And Heston’s towering charisma eclipses even Brynner’s formidable magnetism. To take advantage of it, Jackson here gets triple the screen time he got in the ’38 version, and it was a wise move. It comes at a cost, however: the expansion of Jackson’s role is at the expense of Lafitte’s, meaning we get a lot less piratical scoundrelry and Gallic swagger, and a lot more self-congratulatory American myth-making. And unfortunately, the story’s told with an old-school staginess that’s even hokier than it was twenty years earlier. DeMille was ailing—this was his final picture—so his son-in-law, Anthony Quinn, is the nominal director, but this film has ol’ Cecil’s showy fingerprints on every frame. The entire production is bloated with self-importance, and the Technicolor is so damn bright it often looks cartoonish. The script is substantially rewritten from the original, and the dialogue somehow got even more clichéd and wooden in the process, so stiff that it’s more than most of the supporting cast can comfortably handle. Inger Stevens as Lafitte’s love interest, the governor’s daughter (historical interruption: LaFitte actually romanced the governor’s wife), is a blonde mannequin, and the aging Charles Boyer as Napoleonic cannoneer Dominique You can’t compete with the energetic performance of his predecessor, Akim Tamiroff. E.G. Marshall and Lorne Greene are similarly wasted. The only actors who can mouth these awful lines with conviction are Brynner, Heston, and Clare Bloom in an early standout role, who shines as a hard-bitten pirate wench. The piratical antics of the original are sadly diminished, because this time around the emphasis is on building up to the set piece of the Battle of New Orleans, expanded from ten minutes in the ’38 version to a full half hour here. This does not improve it: all the extra fussing about supply shortages and scouting the British lines just drains the urgency out of the fray, and by the time of the battle’s inevitable end in windrows of fallen redcoats, we’re glad it’s over. At least this version retains LaFitte’s post-battle humiliation, repudiation, and escape to the freedom of the high seas, an ending that comes across as a strange refutation of all the nationalistic breast-beating that precedes it. All in all, The Buccaneer is an interesting failure almost redeemed by the sheer star power of its two leads.